Tuesday will offer the area its best shot at some sprinkler relief within the extended forecast. The streak of days in the 90s will likely end Tuesday due to additional clouds and showers, but plenty more heat is ahead to end the week. Today and Tonight: Showers and thunderstorms will be scattered to widespread on Tuesday. Some of the thunderstorms could produce gusty wind or hail. A bit of sun in between the action will allow highs to climb into the upper 80s. Overnight will be quieter with lows in the low 70s. Up Next: A stalled front may continue to aid in isolated to scattered showers and thunderstorms Wednesday, however confidence in anything more than isolated activity is low. Rain coverage will really back off by Thursday. 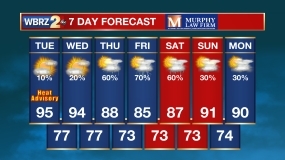 Temperatures should remain constant through this period, staying in the low 90s. We will have a break in the moisture on Friday, but a pretty typical summer pattern of heat, steam and isolated showers is anticipated for the upcoming weekend. The Tropics: No tropical development is expected in the Atlantic Ocean, Caribbean Sea or Gulf of Mexico over the next 5 days. Hurricane Season 2018 is just underway. Keep in mind that while the next few weeks may be fairly quiet, activity usually peaks in August and September as locals begin to enjoy college football season. A stationary front will linger across the area through Wednesday. A distinct 500mb shortwave will ride across the boundary on Tuesday providing much better coverage in showers and thunderstorms. Scattered to widespread activity is expected. While lapse rates are a bit lower as is typical for summer, abundant moisture and instability could result in a few stronger thunderstorms and the Storm Prediction Center has outlined the WBRZ Weather forecast area in a 1/5 “slight risk” for severe thunderstorms. Gusty wind and hail would be the main threats. By Wednesday, the stalled front will be the primary mechanism in creating any showers and thunderstorms as marine breezes interact with the boundary. This front will weaken and possibly lift north as a warm front by Thursday. From that point through the weekend, diurnal heating and coastal breezes will be the key drivers in a typical, summer isolated convective regime. Very little change in temperatures is expected with highs and lows at to barely above normal.